Instead of starting with a top end product launch and working its way down, Nvidia is launching its new GPU architecture, Maxwell, directly into the mainstream segment of its product stack, going straight for the big-money mass market. The £90 Nvidia GTX 750 1GB and £115 Nvidia GTX 750 Ti 2GB are the first Maxwell GPUs and both should be available now. It's the latter we're looking at today, and its price sees it slot nicely into the market between the £100 AMD R7 260X 2GB and the £135 AMD R9 270 2GB. Nvidia is currently being very tight-lipped as to how and when the rest of the Maxwell range will play out. It's specifically calling this the 'first generation' Maxwell architecture, and saying only that the second generation will target the performance and enthusiast segments at a later date. Before we delve into Maxwell, it's worth discussing and attempting to clarify Nvidia's naming strategy. As the above image indicates, both new cards are effectively billed as replacements for the GTX 650 Ti (with the GTX 650 Ti Boost seemingly forgotten about). You might have expected Maxwell to have launched as the GTX 800 series (e.g. GTX 850 Ti). 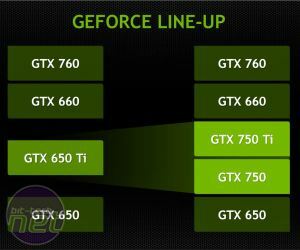 However, while the rest of the GTX 600 series is now considered end of life, Nvidia is keeping both the GTX 660 and GTX 650 in the current GeForce product stack, and felt it would be too confusing to have two 800 series products sandwiched between two 600 series products. Nvidia is aware that the present solution still isn't ideal, but then again the hardware industry is hardly known for its commitment to logical product names. The biggest theme of this launch is improved performance per watt, something that's becoming more and more of an emphasis in major hardware launches alongside increased demand for small form factors and mobile computing. The new GM107 GPU used in both cards is specifically designed for power limited environments (including notebooks, interestingly). In fact, Nvidia boldly claims that the GM107 GPU used in both new cards is the most efficient GPU ever built. 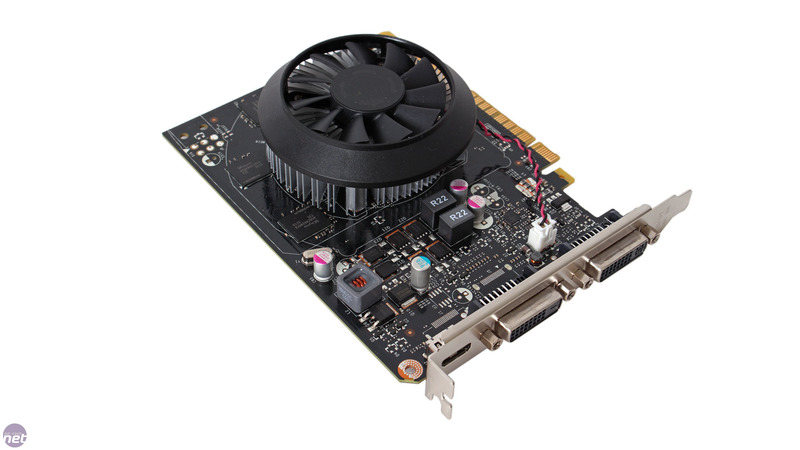 The GTX 750 Ti has a TDP of just 60W, and since a PCI-E slot can deliver up to 75W, the card has no external power connectors. As such, Nvidia is pitching both it and the GTX 750 as ideal upgrades for basic off the shelf PCs as well as good matches for very small form factor builds. In both cases, PSU wattage and 6-pin connectors are likely to be limited – only a basic 300W PSU is required. Despite these minimal power requirements, Nvidia claims that the GTX 750 Ti is capable of outpacing AMD's R7 260X, a 115W TDP product with a single 6-pin connector. 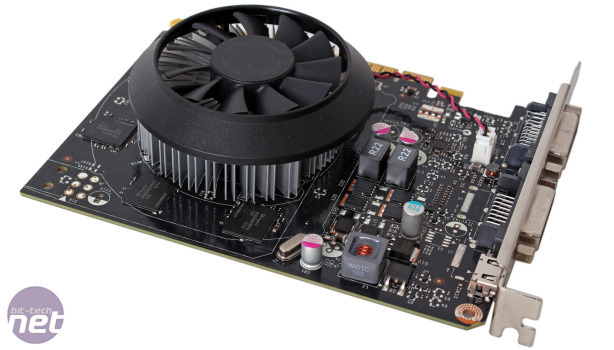 It also boasts that the new card offers over twice the performance of the older GTX 550 Ti (116W TDP) at almost half the power, and roughly the same performance as a GTX 480 all within the power bracket of the GTS 450. 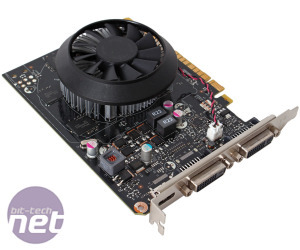 The GTX 550 Ti and GTS 450 are important cards to bear in mind – they're both currently very popular according to the Steam Hardware Survey and are the types of card that people shopping in this price bracket are likely to be upgrading from. From a performance perspective, this market segment is hardly exciting – Nvidia is targeting 1080p gameplay at normal to high settings. However, it is where the majority of GPU sales are made, and it's important for that reason alone. 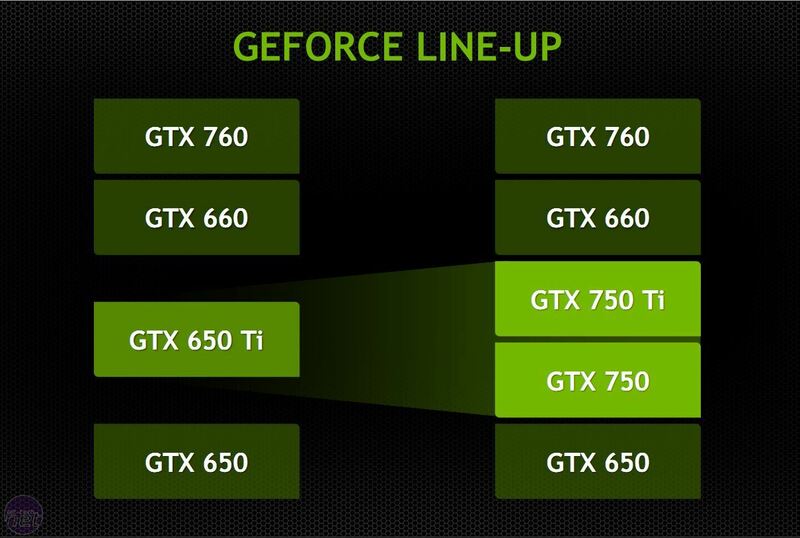 As a new GeForce product, the GTX 750 Ti supports all of Nvidia's latest gaming technologies. Through the GeForce Experience software, users can enable ShadowPlay, which utilises the onboard H.264 encoder to record gameplay, and which has recently had Twitch streaming added as a beta feature. The encoder is also what allows gameplay to be streamed to the Nvidia Shield. Finally, Nvidia's G-Sync monitor technology is also supported by the GTX 750 Ti GPU. 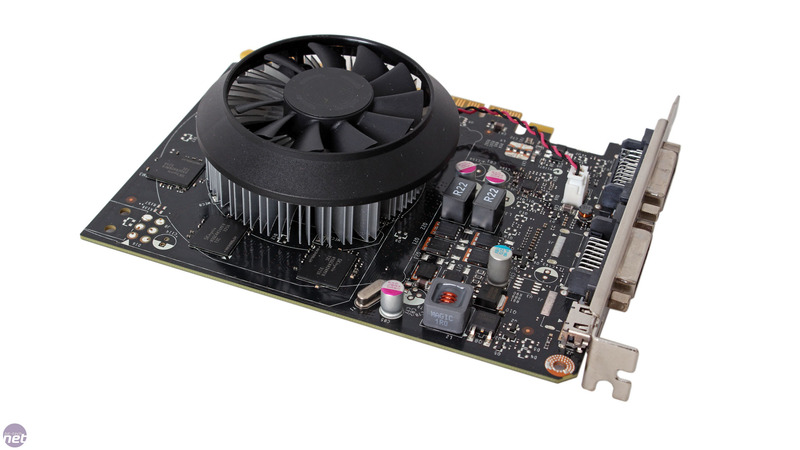 Asus has given the Strix treatment to Nvidia's latest GPU, the GTX 950.